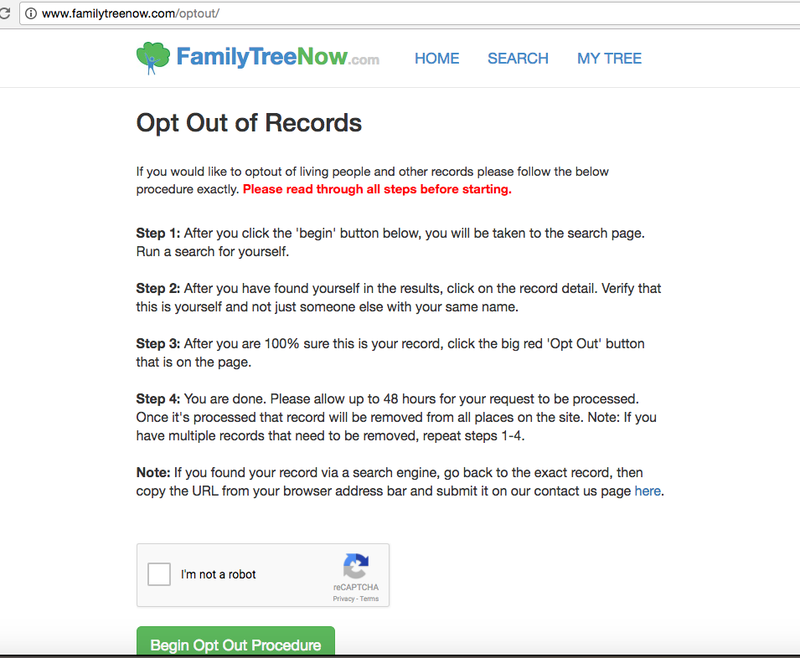 Several people have contacted me in the last twenty four hours about a relatively new site called FamilyTreeNow.com. The site is one of a couple of large 3rd party data aggregators that are advertised as a way of finding genealogical information and/or locating lost friends. It all sounds great – “make finding family free!” – but it can be extremely dangerous for those who are subject to stalking or other forms of harassment. Additionally, sites like these can be a treasure trove for identity thieves. When sites begin to list not only family members but “possible associates” things start to be downright weird (to put it mildly). While this particular company, which was founded in Ca in 2014 according to incorporation documents, has a number of Better Business Bureau complaints, I submitted my take down request yesterday and am pleased to say that my information is no longer available on the site (FamilyTreeNow.com/optout). People may have widely divergent experiences, however, and I suspect that the social media flurry will keep them busy for a while. Digital information and privacy/security experts suggest that we all do a “lock down” or “clean up” session regularly – as in every three to six months. This is a pain, but it’s also important. I regularly take down my information from the most notorious data aggregator, Spokeo, and it was back up after just a few short months when I looked again yesterday. Here are a few quick resources for a digital lockdown and for more please our Lock Down Your Digital Identity page or the great Safety Toolkit created by Take Back the Tech, which is translated into 16 languages. Also see the Chayn Basic DIY Privacy toolkit, available in English, Farsi, Pashto, Russian, Arabic, Spanish, French, and Urdu. What it does: Finds out what personal information on you is available online so you can take it down. How long it will take: 15 to 30 minutes, possibly longer if you go through the manual removal request process. Will I ever have to do it again? Yes, about every three months or so to be safe. Search Pipl to get a you a sense of what information is associated with your name on the web. Search Zaba to see what location/contact information is available for free about you. 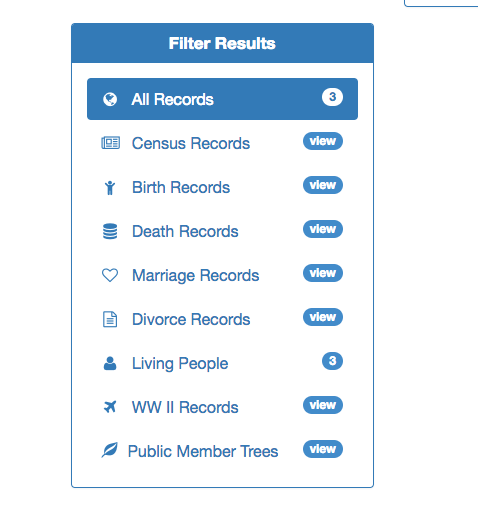 Search FamilyTree to see what collected info is available for free on you. Spokeo is a particularly powerful information aggregator. You have to go through and click on each instance to request a take-down, but they will process requests. However, if you submit a large number of take-down requests they may block further attempts. To manage this, start with most recent listings first, and move IPs if possible if they block the one you’re working from. What it does: Locks down all your privacy settings in Facebook, and hides your old posts so people can’t dig through them. How long it will take: 15 minutes. Will I ever have to do it again? No, but it’s good to check every six months. Lifehacker has an excellent, comprehensive guide on this topic. A friend recently asked me if any of this is even worth it given how much data is out there and that it’s a repeated process. I can’t guarantee that this will keep your data out of the hands of people who want to abuse it and you, but I can say that it slows them down. Companies have privacy guidelines and if they allow for take-down requests then they should be honored. There are services you can pay to do it for you – but most security experts say that this should be a part of our everyday lives – like all the other hygiene, we’re responsible for keeping our digital selves in good shape. If you have family that are particularly into genealogical work, you might also consider a conversation about consent and your information. Someone else’s hobby might be putting your information out there for others to find and use. Privacy and the right to privacy can entail fairly mundane information that falls under the category of “Personally Identifying Information” – this includes age, address, as well as contact information, social security or school ID numbers and more. The context where most people are familiar with PIP is healthcare, where the Health Information Portability and Protection Act (HIPPA) covers a very detailed set of identifying information both while a person is alive and within 50 years of their death. For those interested in the general privacy landscape, the Wikipedia page on Internet Privacy is a fine place to start and Bruce Schnier’s work is also accessible and up to date. Additionally, non-profits like the Electronic Frontier Foundation have extensive resources. FemTechNet’s Center for Solutions to Online Violence, The Crash Override Network, and others have been putting out resources for women in particular.